This stately Provence 5 Drawer Dresser is crafted of high quality oak wood, in an impressive design. 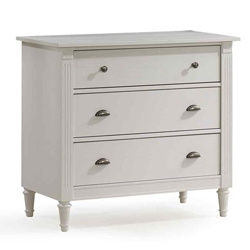 With its precision fluted feet and antique metal knobs, this dresser boasts a modern interpretation of a classic design. With 5 deep drawers for all your storage needs, and its slow motion, anti-pinch drawer glides for added safety, this dresser will surely suit you well, for years to come!